From BCR ... "Mature, caulescent, upright rosette to10 cm diameter x 15cm. high. Leaves only little channeled, outer leaves long, strongly recurved, slightly curled at the tips and stiffer. Inner leaves short,straight and softer. All leaves wide at base. Silver-grey leaves are covered with densely soft trichomes. Quite densely, brownish, horizontal stripes cover all leaves, apparently due to a lack of scales. This comes from the seed parent, which was as well a striped T. straminea. Long, thin, erect peduncle (20 cm) , branched inflorescence bears lavender flowers with white centre eyes. Reg. Doc. 6/2016 by Tanja Richter. Germany." Peter Tristram ... "The banded-leafed Holm hybrid will be named Holm’s Tiger by agreement with Tanja. I have auctioned a couple at conferences/meetings. 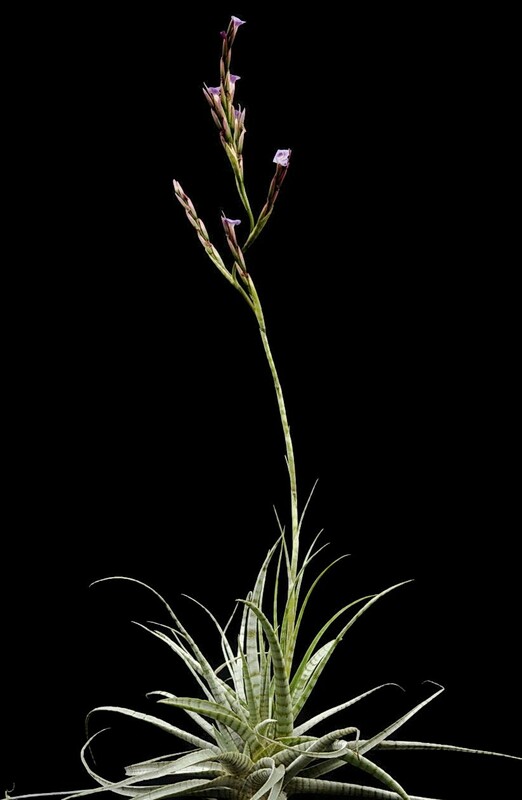 Please also note that Holm’s Belle (polzii x aeranthos), that some collectors will have, has been registered as Holm’s Azurite due to me assuming Geoff had acted on registering Holm’s Belle after the discussion last year (instigated by John O). It was a busy year. If you have Holm hybrids, mainly from Chris Larson or me, it would be a good idea to check the BCR to see if they have been named yet. As Chris has pointed out, some plants (usually rare) are often only available as singles, so many years can pass before they become available. I am still building stock of many of my European imports including ones from 2006. Patience is required. Sometimes another source is found such as with T. reuteri which just showed off. My original plant came from Heidelberg BG, just one, then in 2012 I obtained seedlings from Jeff Kent in the US who had grown habitat seed successfully, or this baby would have been a ‘patience’ plant too."